Networking is a marketing tool that will help you find future business. Networking is relatively inexpensive but it does take a commitment of your time. Networking is a fairly recent phenomena and as old as business itself. Business networking is meeting people, presenting to them and making them aware of who you are and what you can do. All this used to take place in the pub or at the golf course and now it takes place in organised business networking events in almost every town in the country. Why should you consider networking? Some people find networking easier than others. Some people are gregarious and like to meet new contacts and enjoy presenting what they do to others; some people find it a little harder but networking events are designed to make it as easy and comfortable as possible for everyone. You might have heard about networking but dismissed it as not right for your business. Perhaps you should reconsider that. All sorts of business people attend networking events and very often it is the more forward thinking, entrepreneurial and successful who tend to be in attendance. That should make you consider networking if nothing else did. Surely those types of people are your potential customers? 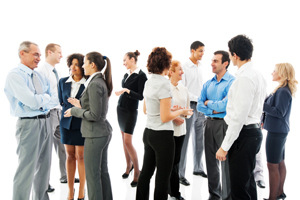 Property developers, estate agents, hoteliers and health club managers may well attend networking events. All people who might be interested in pools, saunas and spas – or know people who are. In that regard, networking and social media have a great deal in common. It isn’t just about the people you connect with and communicate with directly; it is about their circle of friends and contacts too. Networking groups are fantastic places to get your business recommended and referred by other people and that is where their real strength lies. When you talk about your business, be succinct and interesting. Write down what you are going to say before you attend your first network meeting. Present your business in a way that it will be memorable to the other members of the group. You business sells a spa or a sauna or a pool but people are buying relaxation, wellbeing or even one of life’s most enduring luxuries. You can build a good rapport with people when you know about their challenges and aspirations and they know yours. In conversation, your goal is to build relationships based on trust and not to do a sales pitch. The aim of networking is to create goodwill by being helpful, likeable and knowledgeable. You never know how useful a contact is going to be. The more people you win over, the more likely your message will reach your target market. What are the advantages of networking? Networking works on lots of different levels. You can meet potential customers and people who could recommend you to possible future customers; you could also meet suppliers, advisers or even business partners. Complementary businesses like architects, interior designers or property developers will become ambassadors for your business, passing customers your way. In the wet leisure business, the social networks of the other networkers may well prove to be just as important but just think how great it could be to have a respected local businessman singing your praises to his friends. You are sure to find some local networking events, groups and clubs in your area if you do a little online research. Other good places to look for information and ask for advice on what network events might be best for your business would be your local Chamber of Commerce or business support organisations such as Business Link or your local Enterprise Agency. Some events are free and some ask for a membership fee. Look at what both sorts have to offer before you decide, as there are advantages to both. Finally, the most important thing to remember about networking is that it is about meeting people, not selling to them. If you make good friends and great contacts then the sales will come in their own time.